The Phat Eatery dining room. Photo by Chuck Cook Photography. Before an evening of trick-or-treating, spend the afternoon saying “hello” to new Malaysian restaurant Phat Eatery at 23119 Colonial Parkway in the new Katy Asian Town center. The Katy Chamber of Commerce is hosting an official ribbon-cutting ceremony there starting at 2:30 p.m. At 2:45 p.m., a Chamber member is speaking to attendees then the ribbon-cutting is being celebrated with complimentary light bites and refreshments. 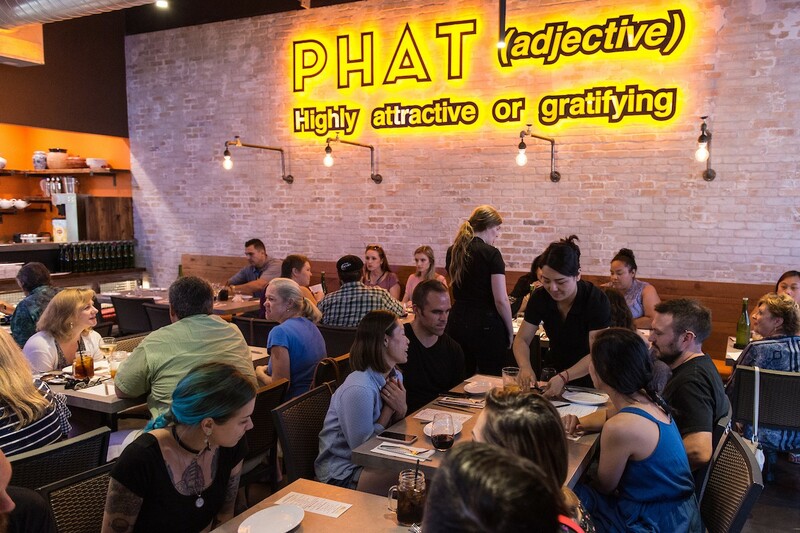 “Phat” is slang for “highly attractive or gratifying” and that’s the idea around which owner Alex Auyeung designed Phat Eatery. 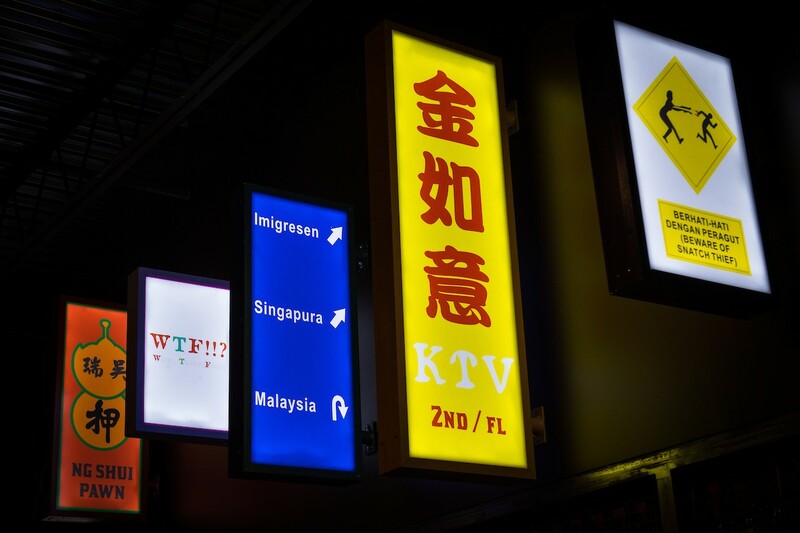 Colorful, brightly lit signs mounted on the walls evoke the street food stands of Malaysia in a contemporary, comfortable and stylish dine-in environment. The fun, colorful, Malaysian street stand-style signs at Phat Eatery. Photo by Chuck Cook Photography. Since the restaurant opened in June, some early diner favorites include beef rendang, made with big chunks of beef shank in curry sauce, Sizzling Tofu (the tofu is even made in-house and diners can opt to add chicken and shrimp, or vegetables) and CK Teow, Phat Eatery’s version of the classic Malaysian flat noodle dish char kway teow with shrimp and calamari in a smoky sauce with soy. In addition to the beef rendang, there are other Malaysian curries as well, including Curry Laksa, Curry Chicken Noodle Soup, and Malaysian Chicken Curry. A perfect starter to any Phat Eatery meal is the roti canai, a scratch-made bread that arrives piping hot from the kitchen to the tables. 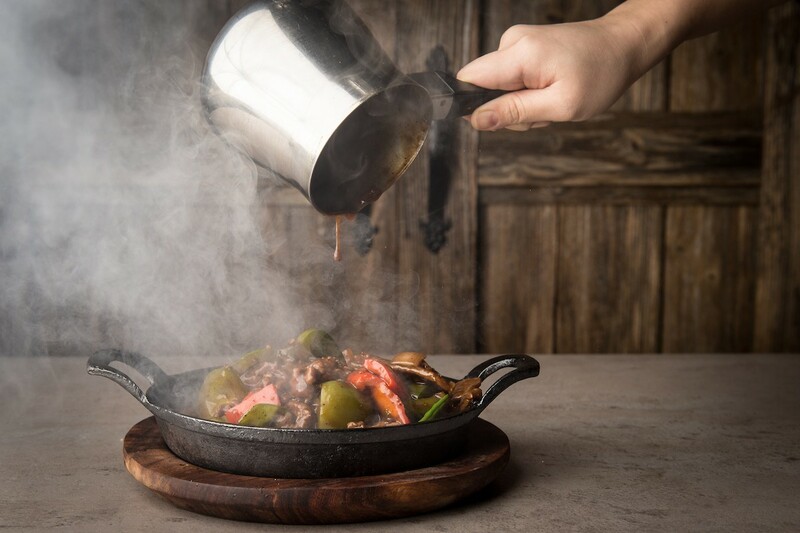 Black Pepper Sizzling Beef served table side at Phat Eatery. Photo by Chuck Cook Photography. Phat Eatery complements its dishes with local beers from breweries such as Saint Arnold and Karbach; imported beers like Tsing Tao, Singha, and Tiger; a variety of wine specials, nonalcoholic beverages include fresh young coconut — a classic, cooling choice — and traditional sodas. Visit for the ribbon-cutting ceremony — or drop in anytime! To make reservations, please call (832) 913-6382. Phat Eatery serves lunch from 11 a.m. to 2:30 p.m. and dinner is served from 4:30 to 9:30 p.m. Sundays through Thursdays and 4:30 to 11 p.m. Fridays and Saturday. For more information, visit the Phat Eatery website, Like the Facebook page and follow Phat Eatery on Instagram.